Are you ready to be the next steward of one of our area's most recognized historical buildings? 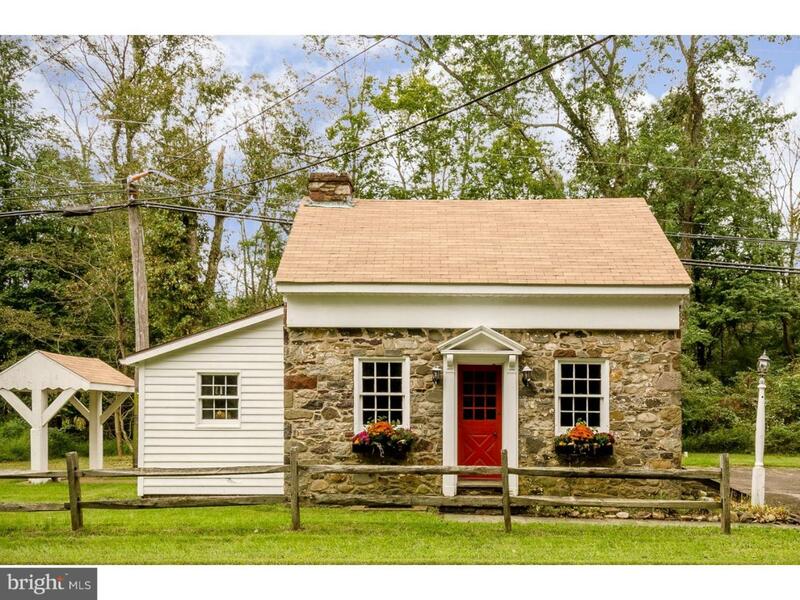 This early stone structure on the way to Washington Crossing may have been a settler's cottage or toll house, but most recently it served as an office space. Its picturesque fa~ade centers on a red entry door with a simple, early 19th-century pediment. Inside, wide-plank beadboard paneling, a beautiful stone fireplace and exposed beam ceiling create a rustic yet warm environment. Paned windows highlight a brightly lit shed-style add-on with brick floor and custom built-in book shelves, which then creates a second room. Upstairs is a large single room, again with wide-plank beadboard on the walls, pine board floors and the exposed stone of the fireplace chimney. Two 6-over-6 sash windows on each side of the room provide good natural light. Located on 1.82 acres and surrounded by protected land, there are many possibilities here. Please contact the listing agent for additional information. Cash offered will only be considered.